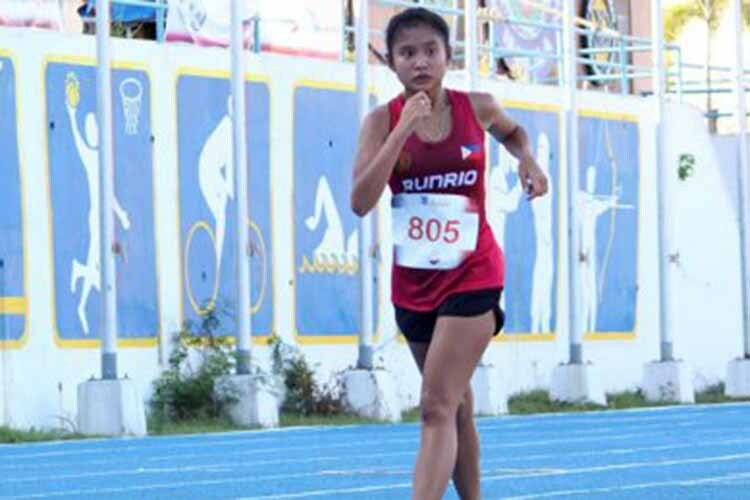 LAGAN CITY, Isabela — Alana Julianne Halagueña, representing Run Rio-University of the Philippines Team, won the girls 5,000 meters walk on Monday in the 2018 Ayala Philippine Athletics Championships at the Ilagan Sports Complex here. Halagueña, a Grade 11 student at the University of Asia and the Pacific in Pasig City, clocked 31:17.5 to win the girls 5,000 meters walk over teammate Sally Campus, who finished second in 32:11.5. Team Titus’ Juliana Talaro placed third in 32:29.5. It was the second gold medal this year for Halaguena after winning the same event last month at the Philippine National Games in Cebu City. Run Rio-UP Team, which grabbed the overall leadership from Dasmariñas City on Sunday night, has garnered 14 golds, 16 silvers and 11 bronzes as of 11 a.m.
Those who delivered the gold medals on Sunday were Marjun Sulleza, Marisol Amarga and the boys 4×100 meters relay team of Algin Gomez, John Carlo Yuzon, Kenneth Corpuz and Sulleza. Sulleza, a graduate of St. Alexus College in Koronadal City, South Cotabato, won the boys 110 meters hurdles event in 14.92 seconds. University of Perpetual Help System DALTA’s Bryan Nino Dumaguit (14.96) and Tuguegarao City’s John Wayne Pe Benito (15.31) placed second and third, respectively. Amarga, who is training with the team for a year now, registered the best time of 2:14.96 in the girls 800 meters event. RP Team-City of Ilagan’s Tara Borlain finished second in 2:16.07 while Team Baguio City’s Mary Grace Zamudio was third in 2:17.75. In the boys 4×100 meters relay team final, Run Rio-UP Team submitted the fastest time of 43.48 seconds against San Beda University-Manila (43.92) and CSF Knights (44.47). “I am happy that we’re leading,” said race organizer Rio de la Cruz, who is also head coach of the University of the Philippines track team. He earned a Physical Education degree in the same school. “This is the first time that our team joined a big tournament like this and I am happy with our performance. I also want to give the athletes, especially the young ones, the exposure they need,” said the 36-year-old De la Cruz, who won the Rookie of the Year honors in the University Athletic Association of the Philippines (UAAP) in 2001. Meanwhile, Edwin Giron Jr. topped the boys 800 meters run for Dasmarinas City, which now has 11 gold medals, six silvers and one bronze. Giron clocked 1:52.70 to win the race over San Beda University-Manila’s Anthony Bacle Jr. (1:56.67) and Run Rio-UP Team’s Ferdinand Tridanio (1:56.74). Philippine Army won the women’s shot put (Narcisa Atienza), women’s 800 meters run (Ailene Tolentino), men’s 5,000 meters run (Richard Salano) and women’s 5,000 meters run (Jho-An Villarma) to remain in third place with 10 golds, five silvers and six bronzes in the tournament organized by the Philippine Amateur Track and Field Association (PATAFA) and supported by MILO, LTime Studio, Soleus, Cocolife, UCPB Gen, Foton, Cherrylume, Rebisco, F2 Logistics, International Association of Athletics Federations (IAAF) and the Philippine Sports Commission. Clinton Kingsley Bautista ruled the men’s 110 meters hurdles event for RP Team-City of Ilagan, which ranked fourth overall with nine golds, four silvers and three bronzes. De La Salle University is in fifth place with five golds, including two from Daniela Daynata, who won the girls discus throw and javelin throw, to go with four silvers and two bronzes. The other gold medalists were Cantafa-Camarines Norte’s Melvin Calano (men’s javelin throw), Sabah Malaysia Team’s Mohd Eizlan Dahlan (men’s high jump), University of Santo Tomas bet Jhon Lawrence Balleslos (boys’ hammer throw), Ateneo de Manila University’s Alexie Mae Caimoso (girls heptathlon) and Sheila Talja (girls triple jump), and University of Baguio’s Felyn Dolloso (women’s triple jump). In the Masters division, the gold medalists in the 10,000 meters run event were Philippine Army’s Erinio Raquin (30-34 years old), Jobert Carolino (35-39 years old), and Rodolfo Tacadino (55-59 years old); Dairuk Running Club’s Noel Fabros (40-44 years old) and Melchor Carig; and LGU Penablanca’s Marlo Pagulayan (45-49 years old), while in the long jump event, the winners were unaffiliated Honeyjoy Salaysay (30-34 years old), Soleus L-Timestudio Team’s Elenita Punelas (45-49 years old) and Emelie Rosale (60 years old and above).